Each variety in this set contains only one ingredient: pure, American-grown garlic. Foodies and home chefs know how garlic can bring warmth and depth to the flavor of almost any savory dish. With Raema Rotindo's gourmet seasonings, they'll discover the difference quality makes. Supermarket garlic powders are often full of fillers and additives, and use less-flavorful varieties of mega-farmed garlic, but each variety in this set contains only one ingredient: pure, American-grown garlic. The Original Garlic Dust packs all the flavor punch of raw garlic, and is just as versatile. Black garlic gains its characteristic color by being heat fermented over a period of weeks, and Black Garlic Dust preserves its subtle flavor with hints of balsamic vinegar. 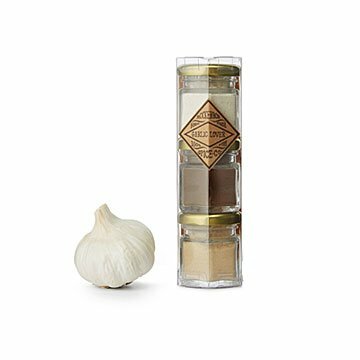 The Roasted Garlic Dust has been slow-roasted before drying to bring out the sweeter notes of natural garlic flavor. Made in Baltimore, Maryland and packed in Schoharie, New York at a facility that provides employment for adults with special needs. I love the choices in this set. A garlic for almost any dish or flavor! Inject meats alot. Powder doesn't clog injectors. The texture or consistency of these spices was extremely powdery. The flavor got lost during cooking, even when it was the only spice I included in the dish I was preparing. After more than a few attempts cooking with these and being disappointed and frustrated with the results, I put them in the trash. I wanted to love them and was excited to begin using them. Unfortunately for me, they didn't work and I can't say I would recommend them. For me, they were a waste of money. My mother is the best cook in the world! One of her favorite ingredients to add to her dishes is GARLIC! Considering it was her birthday, this was an ideal gift. She expressed that each garlic variety, offered in this set, had a distinctive flavor. She loved her gift and I can not wait to taste her culinary creativity! Thank you for making not only my mother happy, but also my tummy. Yum! This was a fabulous gift!!! My hubby loves to cook! So it is just what he needs!! !